Peacock is a special effect custom coating and variations will occur. The background color of the Peacock effect can range anywhere from a Topaz to a Red color. 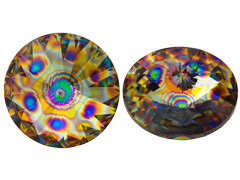 The base Crystal rivoli is manufactured by Swarovski and the Peacock effect is an after market coating not applied by Swarovski. This product was added to our catalog on Tuesday February 28, 2012. If you're looking for a bead that will sparkle across a room ..